Provide comfort for the family of Walter Fedoronchuk with a meaningful gesture of sympathy. Wally passed away peacefully January 10 surrounded by his family, after a long battle with a failing heart. He grew up in Winnipeg and graduated from Tec Voc High School with training in Auto Mechanics. He spent most of his early adult years living in Winnipeg except for a short time in Thunder Bay with Pearl when they were first married in 1974.They met while on vacation in Hawaii and they started a romance and adventure that continued over 44 years. Previously, he was married to Rose. Pearl and Wally fell in love with Pinawa and decided to settle there permanently after they were both retired. Wally loved living in Pinawa and could often be spotted on his bike making his way to morning coffee with his buddies. On Saturday mornings, he and Pearl enjoyed breakfast with friends at the Golf Course. Dad and Pearl also spent many hours out in their little sailboat when they were younger. There was nothing more relaxing than catching a good breeze and spending a few hours sailing on the water. He loved to putter in his garage and was quite accomplished in wood working, keeping busy making lovely gifts for his family. Wally and Pearl loved entertaining and they hosted numerous parties over the years. At Christmas, he loved playing Santa for friends and his cherished grandchildren. He had a booming voice which sometimes scared the dickens out of the little ones, but they loved having Santa appear to entertain them and hand out treats. As the kids and grandkids grew older, he loved shopping for special items from Harbor Freight in Texas and surprising them at the annual “Christmas in October”. This party was held just before they were due to head down to Texas with the motorhome for the winter. They wintered in Texas up until two winters ago, when the drive became too much for him. Dad missed Texas and his friends there very much. 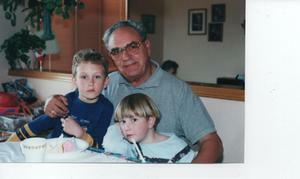 Wally loved times spent with his family and “Grandpa Wally” always had more than enough love for all. He adopted all the Sparling children and many others, as his own. There was nothing that made him happier than having the family come out for a visit. He especially loved having them come out for the annual Pinawa Birthday weekend and he would take great pleasure in sitting out on the front lawn with them watching the parade and catching candies. He thought of his sons-in-laws as “his boys”, first welcoming Craig, John and Michael, and later Glenn. He loved having his sons around. Wally was a professional driver most of his life. He owned and drove several taxicabs at Duffy’s in Winnipeg for a great many years. In Pinawa, he became a volunteer driver for the Seniors Group. Wally loved to drive and was always excited to head out on a long road trip with Pearl. In his younger years he also taught driving at Kaye’s Driving School. He loved to say that he had helped teach each grandchild to drive. Dad was gifted also with mechanical skills and was proud that he did a lot of the work himself on his cars. For a time, Wally ran a little seasonal business named Mug Shots where he put photos on coffee mugs. During those times, he met Marjorie Salki, a famous Winnipeg TV personality. She featured him on her TV show to showcase his business. He was very taken with her and was pleased with the notoriety it gave him and his business. Wally was a very friendly, kind and generous man. He had a huge capacity for forgiveness and always gave folks the “benefit of the doubt”. Wally leaves to mourn him his loving wife Pearl, daughters Terry Earl-Sparling (Glenn), Lesley Truss (John), and Lynn Hordy (Michael). Cherished grandchildren Jordan, Jennifer, and Stephen Earl/Sparling, Evan and Bailey Truss. There are also many relatives in Thunder Bay and long-time friends Don and Joyce Salie. Our family wishes to thank the staff of both Pinawa Hospital and HSC in Winnipeg who comforted Dad in his final days. Rest peacefully Dad until we meet again. We love you forever. To send flowers in memory of Walter Gerald Fedoronchuk, please visit our Heartfelt Sympathies Store. 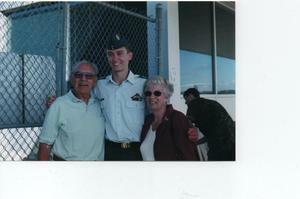 Provide comfort for the family of Walter Gerald Fedoronchuk by sending flowers. Heartfelt Sympathies Store purchased flowers for the family of Walter Fedoronchuk.